Research shows that even a fender bender can cause permanent pain, headaches, even arthritis by exerting literally tons of force to the neck and back. Many car accident victims worry more about their car then they do their health and their rights. If you have been involved in an auto accident call (925) 778-6655 and get checked today !!! Your future might depend on it. Mechanisms of injury have been well established during an automobile accident. 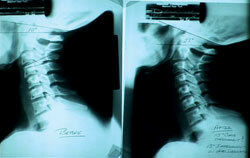 "The forces involved easily damage the supporting structures of the spine. I have always gravitated towards mechanisms of injury probably because I am one of those who actually enjoy the physics involved. For 15 or more years I have studied the effects from automobile accidents and understand what it takes to heal well. I have been hired to testify in superior court as an expert witness and have lectured to Attorney's and Chiropractors and Doctors about the management of these types of injuries.